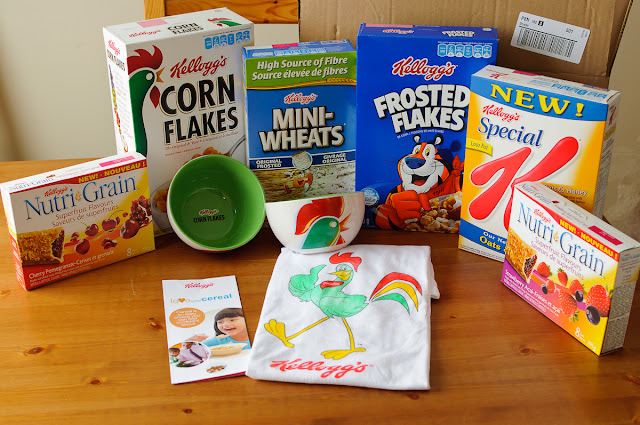 Last week we got this seriously awesome box of stuff from Kellogg's. I posted about it on my Facebook wall. My kids were surprisingly excited considering it was a box of food products! They were thrilled though and immediately wanted to dig in to the new boxes of cereal. We are a cereal- eating family so it is not unusual but I admit we don't often have quite as many varieties available at once. As I have mentioned many times on this blog Aiden has Autism and most kids with Autism have issues with food. Aiden has about a zillion issues with food. One of his issues is that he hates cereal with milk. But he loves eating dry cereal and drinking a glass of chocolate milk separately. So we are fine with that. In this particular case he mixed Mini-Wheats with Frosted Flakes for fun. Olivia first had a bowl of Frosted Flakes (which she likes to call "snowflakes") and then she mixed in some Corn Flakes to see what they tasted like. In the package we got there were two very cool bowls with the Kellogg's rooster on them. This caused some serious wailing and gnashing of teeth until I negotiated the rather-large Kellogg's Rooster t-shirt for Owen in return for first dibbs of the Rooster bowls for Aiden and Olivia. And no, I am not kidding. There were very real negotiations that had to happen in this scenario. And every day since there has been fighting over the bowls and the boys have been fighting over the shirt. Who would have thought Rooster paraphernalia would be considered so cool by my children? In all truth I was not surprised that my kids liked the cereal. I was also not surprised that my husband and I liked the cereal. I was able to try out the New Oats & Honey Special K cereal for the first time and it is absolutely delicious. I will totally be getting that again. 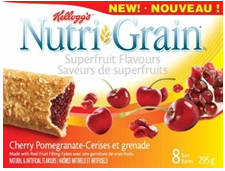 What DID surprise me was the Nutri-Grain Bars. 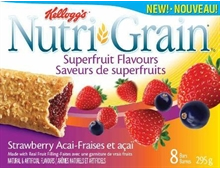 We got two boxes of them - the Kellogg's Nutri-Grain Superfruit Flavours Cherry Pomegranate 8 pack and the Nutri-Grain Superfruit Flavours Strawberry Acai 8 pack. That is not the surprising part. The surprising part is that AIDEN LOVES THEM!!!! My son, the one with Autism? The one who pretty much hates most food? The one who has a list of food aversions a mile long and that we have actually had to do feeding therapy with LOVES these whole grain bars. We have had the two boxes since January 5. It is now January 9. Aiden has eaten 12 of the 16 bars. He even had one in his lunch at school today and ATE it. Ok. Clearly you are not understanding how huge this is but that's ok. Just trust me. It's huge. I never, in a million zillion years would have ever imagined he would have liked them. I offered them to the kids and while I was explaining what they were to Olivia I said that they were sort of like a granola bar with jam inside. Aiden likes plain strawberry jam on plain bread. So he said he would take a bite. That was shocking enough but I went with it fully expecting him to spit it out. But then he loved it. So our household has officially added a new snack food to our list of Aiden-acceptable foods and we are thrilled. Disclaimer: I was not paid to write this post. I was sent that lovely box of stuff as part of the new Kelloggers network.